Manufactured to meet the requirement for Low Smoke Zero Halogen control cables and these cable covers all the popular sizes. 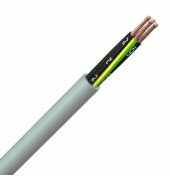 Used in lift shafts, hospital, airports, heating and ventilating controls and tunnels. This cable offers a high degree of flame retardance thereby reducing the risk of spreading fire due to its LSZH properties. Fine copper wire strands to IEC 60228 class 5, Low Smoke Zero Halogen insulation, black cores with white number coding, a green/yellow earth core is included in cables with more than 2 cores, grey Low Smoke Zero Halogen outer sheath. Also available with a black sheath in some sizes. Other sizes are available on short lead time.